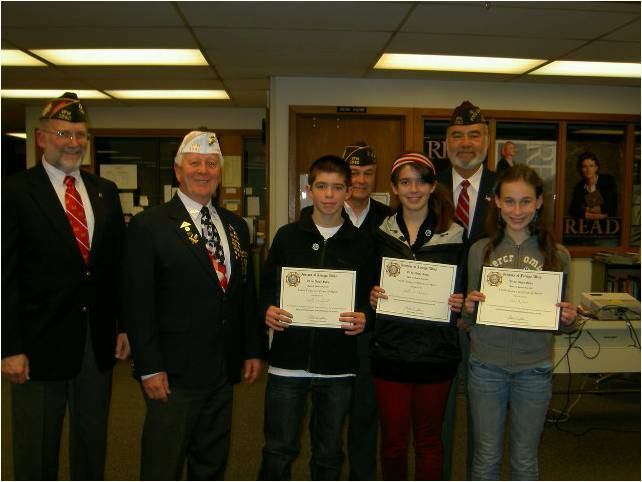 VFW Post 1040 awarded the 1st, 2nd & 3rd place winners of the VFW “Patriot’s Pen” essay contest on Thursday, November 29th. First place was awarded to Hollie Hutchison, second place to Reilly Chappell, and third place to Fran Herr. All three students are in the 7th grade at College Place Middle School. The theme of this years Patriot’s Pen essay was “What I would tell my Founding Fathers”. Hollie now advances to the next level of competition at the District level. Pictured L-R: Brian Seguin, VFW Post 1040 Quartermaster, Martin Spani, VFW Post 1040 Commander, Reilly Chapell, 2nd Place, John Zambrano, VFW Post 1040 Chaplain, Hollie Hutchison, 1st Place, Frank Martinez, VFW Post 1040 Sr. Vice Commander, Fran Herr, 3rd place.